All the blocks (120) are made & laid out, the first six rows are sewn together, and the inner & outer border fabric has been chosen. 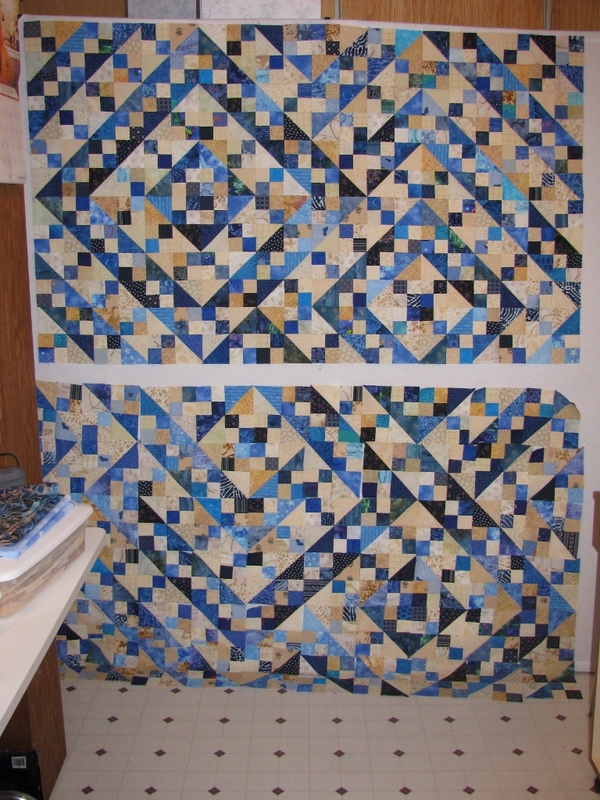 The quilt top is bigger than my design wall, so the last row of blocks is on the floor. I think that my “least” favorite part of quilting is sewing all the blocks & rows together which may be why I allowed myself to be distracted by another project. I started machine quilting on my Dancing 9-Patch top only to run out of thread and had to order another spool. Once the thread arrived I finished the giant spider web quilting. The goal this weekend is to put the binding on the 9-patch quilt and then get back to sewing Blue Ridge Beauty blocks & rows together. I am hoping to have the center completed for Design Wall Monday.